Never thought i would visit Japan during summer because why the heck would i want to experience the heat of another country when my own is summer 365 days a year with occasional rains la. So i came to realised that i was totally caught off guard here because no one really tells you what to bring in summer, it's usually winter that people remind you to bring thick clothes & rely on tons of heat packs to keep warm. But for summer, for us coming from a tropical country we would automatically think that Japan's summer is roughly the same but WRONG. Here's what i learned while i was there and hope listing it out over here can help you guys on your Japan summer trip. "ATSUI-NE" a famous summer phase used by locals, join the fun and learn how to pronounce it so whenever someone says to you "atsui-ne" you can reply back the same lol, It just basically means "it's hot"or reply"sou desu ne" (i agree). Seriously i wonder why don't Malaysians ever consider using these since we sweat more in Malaysia due to the humidity levels. It can be easily found in Watsons/ Guardian made by Biore. If you travel frequently to Japan you'll notice a sales trend over here during each season, like during winter all the heat packs are put out front for you to grab and go, for summer there tons of these body bath wipes sold (many kinds of scents too) for you to keep your body odor in check or just to feel refreshed from all that sweating. It's seriously a handy product, managed to bring back some and i always make sure to have them in my bag because i tend to be out from morning to night and these wipes helps me smell fresh throughout the day. Something deodorant and perfume can't do lol. Like your 2nd best friend siaa for the summer, with that kind of heat that feels like it can burn and melt your skin off your bones, sunblock is to make sure your skin don't get BBQ and protect your from UV rays. Doesn't prevent you from getting darker but at least it lessens the risks of getting sunburned which is much worst especially when you skin starts peeling. In Malaysia i barely use any sunblock because i drive most of the time, so my tube of sunblock usually lasts forever and that isn't a good sign because it's meant to be discarded after a certain period of time. But however in Japan, within a week i managed to finish 1 whole tube of sunblock, that's like an achievement unlock wei! 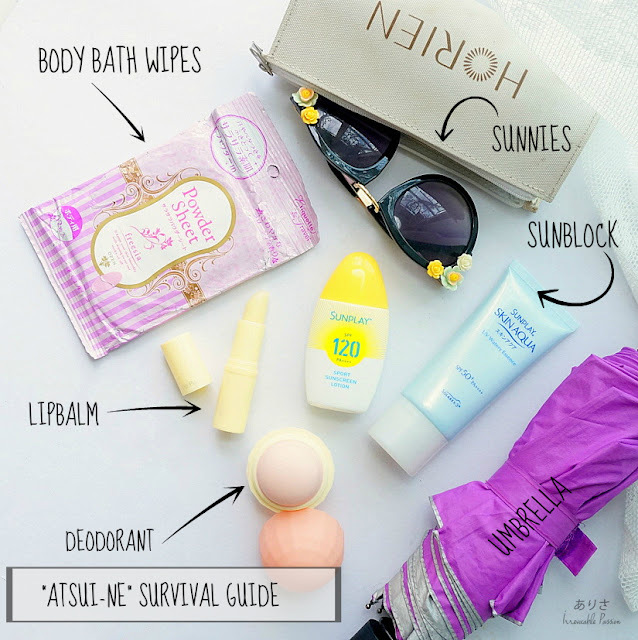 Most people don't like wearing sunblock because of the sticky texture but i've tested a few and can vouch for these brands- Suhadafit, Kose and Sunplay! Like i said earlier, everything is dry so your lips is bound to chap too, if you want to keep wearing your lipsticks then keep your lips well moisturized and don't forget to keep your whole body hydrated too. But hey, it's a functional fashion accessory! You can also later use it as prop for your hipster insta coffee shot and it just makes any outfit you wear look swag. Can't go wrong with sunnies. Can't stress enough to people on the importance of having a foldable compact umbrella in your bag at ALL TIMES. Not only in Malaysia but in Japan too because you just can't predict the weather (yes there's forecasts but not usually that accurate) because it can be one minute sunny and the the next raining cats and dogs and their rain is not like ours which stops in an hour or so, it can sometime rain the whole day to the next. Explains why they aren't too fond of the rain, totally messes with your plans and gets your shoes and clothes drench no thanks to the wind that comes along with the downpour. Though they do sell those cheap transparent umbrellas at convenience stores or supermarkets whenever it rains, imagine each time you pay RM10+ just to shield yourself and the size is rather big too so it isn't practical for you to carry around especially when it isn't raining. And that can only protect you from the rain, not heat, invest in a good UV protection umbrella so you are at least covered for both rain & shine. All my life i never understood the reason behind this invention because your face is still going to get wet, how are you supposed to have a proper vision with rain beating down on your face while your hair and body stay dry ._. Got my question answered, you are supposed to use it together with an umbrella, the rain coat is just to protect your clothes from incoming rainwater that's being blown your way. I learned that the hard way because assuming my trust umbrella could keep my dry while walking to the station, but i was wrong! Arrived at the station close to 80% drenched because of the darn wind that kept threatening to blow my umbrella away, should yell "i'm mary poppins ya'll!" lol wtf, spent 30 minutes in the toilet trying to dry myself off. So lesson learnt, just get prepare a raincoat in your bag, it's cheap & useful. Another hard lesson learned, despite it being so hot during the day, Japan's summer nights can be surprisingly cold like aircond cold + wind it's even worst! I was wondering WHY uniqlo in Malaysia & Japan still sells those foldable pocket sized wind breakers though winter was over and another question got answered through experience LOL. Sometimes we are put in an unexpected situation so it's always good to be prepared, so ladies your big bags should come in handy now and it's good to be paranoid. When the shinkansen i took from Hiroshima to Osaka malfunctioned we were left stranded for an hour in one of the stations halfway (around 11pm) and ended up having to stay overnight at the station before the first morning train at 5am, it was so cold because of the wind and at times like these you wishes you were back in your comfy warm blankets. Thank god i carried my D.VA windbreaker around just in case, bag might be a bit bulky looking but it was worth it because swore i could have froze to death from the constant wind blowing! No one likes a person with smelly pits (overall bad BO) especially when you are taking public transport 90% of the time. The body bath wipes mentioned above helps keeps the rest of your body smelling sweat free but your pits sometimes need an extra special care. Though you never had strong BO before, it's always good to use deodorant as a precaution. This guide applies to both kids and adults, just make sure certain products are child-friendly like the sunblock, moisturizer and lip balm. It's the season of fireworks and festivals too, so don't forget to experience summer like a local wearing a Yukata to a matsuri (festival). You can rent a Yukata or buy one which can cost as low at 5000yen for a whole set. <3 thank you so much for this, Arisa! Will be going to Japan next month and this guide is definitely handy!! You have no idea of the amount of ppl who don't know the existence of deodorants! Baby wipes & lip balm are necessity I always carry them with me every where. Never thought about that Body Bath Wipes. I always use normal wet wipes or hygiene wet wipes. Great tips! Yes it can go up to 40°c too sometimes. u tota;;y answered my question! i'm travelling to Japan next week.. so i really needed this tips! Thanks for sharing! These are actually what I carry everyday in Malaysia. Did you forget a bottle of water? No wonder my bag is huge and damn heavy!!! Wow those are kawaii finds you've got. Yeah my Amore ia in Japan now and he is complaining about the weather. Your deodorant is so cute! It looks like an Eos lip balm lols. I stayed in Japan during summer and I agree, the weather was crazy! I know that's what attracted me to it in the first place lol. I do prepare a lot of thing when I in Japan in April. Have not go Japan during summer. Maybe next round I want book for summer. You should try summer next time! A realize some don't like to carry umbrella when they traval becoz it take space and weight, but i do. Because it helps when its raining and i have to hop from one place to the other.